Ball screws classified as “double nut” appear to be aptly named. However, what seems to be a simple distinction varies from one vendor to another. Let’s clarify the true definition of a double nut and the unique features of Steinmeyer designs. Taken literally, a double nut is composed of two separate nuts that are more or less identical. The purpose of this design is to preload the two nuts against each other and achieve two-point contact on the balls. Preload eliminates play and helps build additional stiffness, keeping the nut centered on the shaft. While there are many ways to achieve preload, Steinmeyer defines double nuts as those that have two-point contact. This makes sense as it describes the double nut from a performance point-of-view, regardless of the design details. The main design challenge involving double nuts is how to join them. Various solutions have been developed around the industry to solve this issue, but most require complex joining with spacers, shims, fitting keys, pins, and setscrews. We believe in a simpler approach. Steinmeyer’s patented UNILOCK coupling system avoids complicated hardware by using a special epoxy. It is proven to deliver a robust connection of the two nut halves, making our double nut nearly as compact and stiff as a single-piece design. It also prevents radial slippage of the two halves, so that the UNILOCK double nut cannot be misaligned. 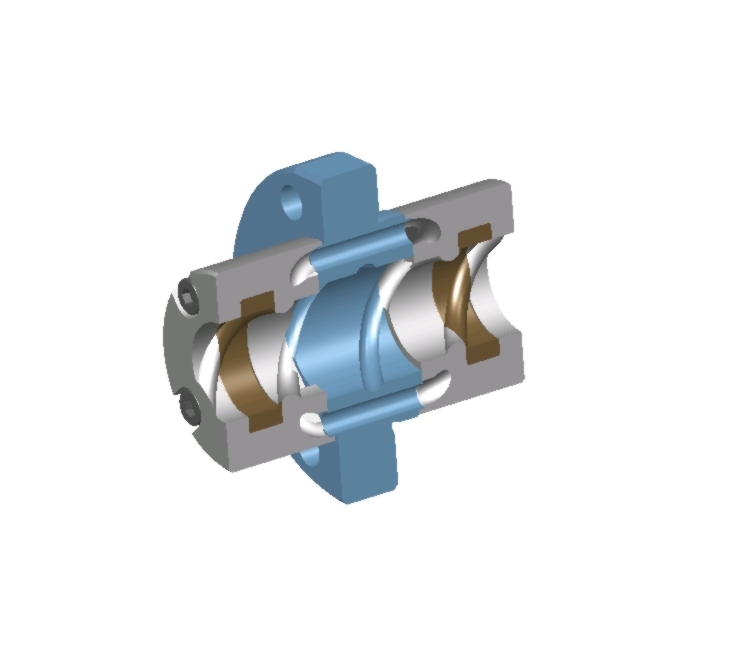 The coupling is rugged and absolutely tight to prevent the loss of lubricant. Contact our motion control engineers to learn the benefits of UNILOCK for your application. In recent years, ball screws have been looked at more and more favorably as replacements for hydraulics. They offer higher efficiency and speed, and can be controlled more precisely with servo loops. And who wants to deal with the unavoidable maintenance and disposal hassle of hydraulics? Steinmeyer has been supporting this market shift with its line of Ultra Thrust ball screws. These screws utilize larger balls to support much greater load capacities. More recently, we have introduced innovations in through-the-nut return systems to push performance even higher. The Ultra Thrust line began with our 50×20 mm nut using 15 mm balls. Our standard nut of that size, with 9.5 mm balls, was rated at a dynamic capacity of about 120 kN (12 tons). But the Ultra Thrust version exceeded twice the capacity, reaching 262 kN. We then expanded the line to include larger nuts. Most of our Ultra Thrust screws in the field are sized at 80×20 or 63×20. More recently we extended the line with a 100×25 mm nut, using 19 mm balls. These screws have proved themselves in the most demanding applications of injection molding. Beyond increasing the ball diameter, Steinmeyer has designed new return systems to optimize the load capacity. Our latest innovation uses multiple through-the-nut return paths, shown in the schematic below. With this system, the screw exceeds 1,400 kN of dynamic capacity! Steinmeyer is recognized worldwide as an elite supplier of premium engineered products. The company enjoys a century of designing and manufacturing precision tools and components in Germany. Throughout its long history, Steinmeyer has been family owned, operating under the leadership of the Beck family since 1940. Ball screws have been the company’s primary product line for decades, and the Steinmeyer brand embodies precision and quality. It also reflects a strong dedication to helping customers achieve engineering excellence. Steinmeyer’s leadership is personally engaged in each customer’s success, and is uniquely qualified to deliver a product that meets exacting standards without compromise on quality, durability, and precision. Steinmeyer has continually invested in manufacturing capacity and technology, maintaining the most advanced facilities in the world. Global service and support provides customers with access to the technical resources to guide their requirements. Steinmeyer’s commitment to financial stability ensures that the company has the proper resources to invest in its facility and personnel without passing along costs to the customer. All of these qualities have allowed Steinmeyer to successfully serve the most prominent customers in our target industries. Like all motion control devices based on contact friction, ball screws require lubrication for proper functionality. The reason is that lubrication is required for smooth recirculation of the rolling elements. Even if a dry lubricant coating is applied to the ball screw elements (shaft, nut and balls), some small amount of conventional oil/grease is still required. In other words, the ball screw cannot properly operate while completely dry. All Steinmeyer ball screws are pre-lubricated at the factory – but only with an initial fill amount. For most applications, we recommend an initial lube check after 500 hours of machine time. Based on that inspection, adjust the maintenance schedule accordingly. Of course, every application is different, and users should develop their own maintenance schedule based on the particulars of their operation. One common scenario that can cause lubrication challenges is repeated use of a small segment of the total working volume. For example, let’s say your X and Y axes have a total travel of 1 meter, but you are machining an area of the part only a few centimeters long. If your machine performs this task repeatedly on many parts, a large portion of the X and Y shafts will be exposed to the environment without ever being swept by the nuts. Plus the balls inside the nut will not receive fresh lubricant. As a result, they may lose lubricant while gaining buildup of dirt, dust, and swarf. These conditions increase the risk of excessive wear when the machine returns to other operations. To guard against this scenario, we recommend two solutions. The first is to create a designated lube “station” at the opposite end of the small operating range. Move the nut to this “station”, apply lubricant, and then return. This operation will ensure the shafts are not only wiped of debris (presuming there are proper wipers at both ends of the ball nut) but also evenly lubricated. Alternatively, if shaft contamination is minimal, you may inject lubricant into the nut while still in the small operating range. Move the nut at least one length to distribute the lubricant evenly within the nut. When the machine returns to other operations, there will be sufficient lubricant inside the nut to cover the shafts properly. See the Steinmeyer web site for re-lubrication guidelines for both oil and grease – lubrication quantities vary based on shaft diameter and nut type. Another alternate solution is to lubricate through the shaft – that is the shaft is cross drilled to allow lubricant to pass through it and into the ball nut at a designated location. This is especially useful for certain oscillating motion situations. For any further questions or suggestions please contact one of our application engineers! Customers often ask us: what type of lubricant is best for my ball screw application? And which is better, oil or grease? The truth is that both oil and grease can perform well in a variety of situations. On the other hand, grease has an edge at slow speeds because it offers better wear protection under mixed friction or boundary friction conditions. Also, lubricant loss with grease is lower than with oil, so grease can be used for long-term or “for life” lubrication. Attention must also be given to the wiper choice in all cases. Steinmeyer has extensively studied the performance of a wide variety of oils and greases. Some of this work was conducted by the tribology lab of a major European research center. Details are available on our web site. This test set-up was designed to mimic the specific tribological conditions found in industrial ball screws, both in terms of lubrication film build-up and wear. One key finding was that the coefficient of friction does not seem to be correlated to the wear rate. Some lubricants yielded low friction, but higher wear at the same time! With the exception of a high-pressure grease, which caused the lube film to collapse at high speeds, all greases performed well and yielded acceptable wear rates throughout the test scenario. At the same time it was proven that greases are unable to build a perfect fluid film like oils of proper viscosity, so the wear rate with grease lubrication is higher than the wear rate of oil when an EHD film is present. So oil and grease both have different advantages. The final choice will depend greatly on your application and desired maintenance schedule. Please contact Steinmeyer for a detailed consultation with our engineers! * We strongly recommend CLP grade gear oil per DIN 51517-3 or equivalent. Do not use way oils or hydraulic oils, even if they are labeled “high pressure”! Look for the words “suitable for gear boxes”.